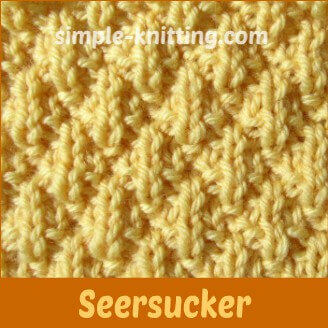 Here's a lovely knit stitch pattern called seersucker stitch. This stitch pattern creates lovely textured stitches and you only need to know how to knit and how to purl. It's even great as a beginner knitting stitch pattern but I bet all knitters are going to love this one. So come on everyone, grab your ball of yarn and needles. You're going to love knitting these textured stitches. The seersucker stitch pattern creates little offset diamonds that puff out a little bit just like the cotton seersucker fabric does. And if you'll notice there's a single row of knit stitches going up the middle of each diamond. Surprisingly, a lot of the rows are simple 1 X 1 ribbing which makes this textured pattern very stretchy and it lies flat. You'll notice as you're knitting that the fabric will pull in a little bit on the sides just like ribbing does. I just love it, it's pretty and so easy to make plus even though it looks really complicated to knit it isn't. Pretty cool. Because you're knitting highly textured stitches you'll want to use a yarn with great stitch definition. A tightly plied yarn (nothing fuzzy) will really make the stitches pop and you'll notice that those little diamonds will puff out. And if you choose a cozy wool yarn you'll also find that those little puffs will lock in the warm air keeping you nice and toasty on those chilly days. I'd love to use this seersucker stitch with a super soft merino wool. That would be dreamy. The seersucker stitch pattern will be great for most knitting projects like sweaters, vests, hats, scarves, blankets and just about anything. If you'd like to knit up a square you can cast on 4, 8, 12, 16, 20 or 24 stitches. Also I'm trying something and would really appreciate your feedback in the comments below. I've highlighted every other row in order to make the pattern easier to read. I thought it might help. What do you think? So would you like to try this stitch in a knitting pattern? Great! Because I found three knitting patterns you can try. Keep in mind that they're not my patterns so if you need help please ask the designers. They'll be able to give you the best reply. That all see relatively simple though so you shouldn't have a problem. I managed to find three seersucker knitting patterns if you'd like to try out this stitch pattern. One of them is a paid one but I really want to include it for all you guys out there because I know how difficult it is to find men's knitting patterns. It's a vest knitting pattern with sizes from XS - 5X. I might even make it for my sweetheart. The price is $6.95 so if you really like the pattern you may want to purchase it.